Barcelona have announced that goalkeeper Victor Valdes will be out for about seven months following a knee surgery. The 32-year-old suffered a cruciate ligament injury while making a routine save in last week’s La Liga game against Celta Vigo. “The Barca keeper has been operated on by doctors Ulrich Boesnisch and Ricard Pruna in Augsburg (Germany) for the anterior cruciate ligament (ACL) tear he suffered last week,” read a Barca statement”. 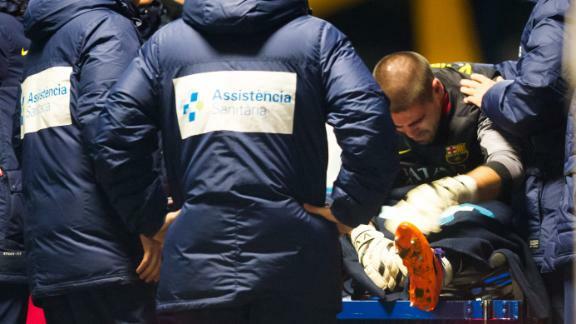 Victor Valdes Was Injured in the First Half of Last Wednesday’s La Liga Game Against Celta Vigo at the Nou Camp. The Spanish first choice will miss the 2014 World Cup in Brazil and could as well have made his last appearance for the Catalans, after disclosing he would quit the La Liga champions this summer. Valdes has featured 535 times for FC Barcelona and conceded just 441 goals. Ferguson Due to Undergo a Hip Surgery in the summer and May Miss the Start of United’s Title Defence. Carroll Completes His Move To West Ham in a Club Record Deal.